I have felt under the weather lately and needed to make supper tonight so I am making a simple crock-pot pulled pork recipe but changing it up by adding blueberries and teriyaki. I really do just want to stay in bed and sip on my lemon and honey hot drink but supper needs to be organized. This is one of those recipes that you can set and forget it. This is also one of those budget-friendly recipes that you can make ahead of time and even freeze for another day. You all know me well enough now that I have a few recipes up my sleeve that are fast such as 15 minute meals or a one-pot wonder. Today I’ve taken out the crock-pot which I just love as you can make just about anything in it from bread to jam, soups and stews to my all-time favourite pulled pork. Today I am going to make for you today my version of crock-pot pulled pork that’s made with teriyaki sauce, Worcester sauce (also known as Worcestershire) and blueberries as well my homemade tomato sauce to top it all off. The traditional pulled pork sauce that most people make is consistent of a BBQ sauce so the addition of blueberries to this pulled pork sauce adds a new dimension to the recipe. I used pork chops on the bone but you can can use any cut of pork that you wish such as pork tenderloin or boneless pork chops but remember to take the pork bones out after it’s done cooking for your dish. 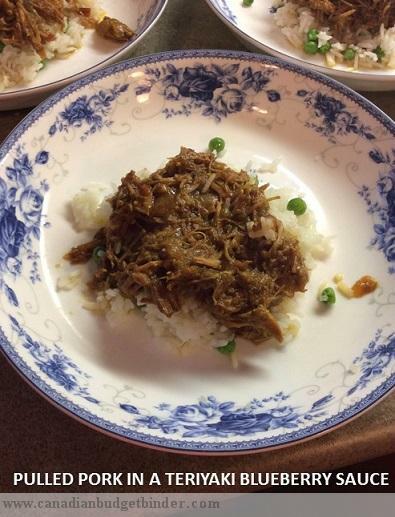 If you remember back in 2013 Mr.CBB shared his Crock-pot Pulled Pork with Homemade BBQ sauce which is also delicious with the sauce he created. This pulled pork is truly a one-pot meal that you can enjoy paired with bread, tortillas, bagels or with flavoured rice. My husbands favourite is having the pulled pork on top of my homemade twice baked potatoes. If you want a delicious meal without all the work check out this pulled pork crock-pot recipe with a lovely teriyaki and blueberry sauce. Add the teriyaki sauce and blueberries. So if you are looking for a meal that your family will love you can’t go wrong if you have meat-eaters at home like I do. I’m pretty sure you will get the thumbs up for this pulled pork and the request to make it again. Crockpot Pulled pork with a Blueberry Teriyaki Sauce looks so yummy! How much does this cost? I am planning to prepare this for my friends, who will be staying tomorrow night here… I know they’ll surely like this.